Nick and Jess 'New Girl': Should They Or Shouldn't They? Sam and Diane. Kevin and Winnie. Ross and Rachel. Jim and Pam. The will they/won&apos;t they couple has practically become a staple of modern television. Nothing keeps viewers coming back like some good old fashioned sexual tension. In its second season, New Girl has evolved past its early stages as Fox&apos;s Zooey Deschanel vehicle into a genuinely funny, heartfelt ensemble comedy. Much of the appeal has been due to the killer chemistry between Deschanel&apos;s Jess and roommate Nick (Jake Johnson). From fights that were really flirt sessions to a drop-your-jaw first kiss, Nick and Jess are quickly joining the ranks of the great will they/won&apos;t they couples who have come before. 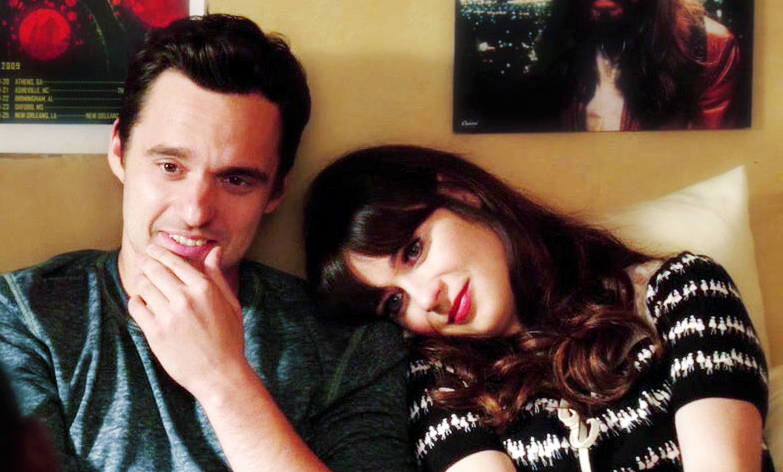 Now that they&apos;ve hit the sheets (gents, this is why you need to watch shows like New Girl, to get lines like "let&apos;s not think about it," though to be fair, those probably work a lot better if you look like Jake Johnson), where will the flirtatious flatmates go next? Will they take a whack at a real relationship, continue the back-and-forth, or decide to call the whole thing off? Six reasons why Nick and Jess should/shouldn&apos;t be together. 1) Because they&apos;re not ready. Yet. Jess can claim "middle school dance" rules all she wants, but so far her honesty about her feelings for Nick have fluctuated as much as Oprah&apos;s weight. And Nick probably needs to figure himself out a little bit. He&apos;s got to get closer to making some of those grown up moves he was talking to Tran about. 2) Because the sooner they become a couple, the sooner they&apos;ll break up, at least for a while. I love that New Girl didn&apos;t take four seasons to get to the first kiss, but if Nick and Jess start something real now, it&apos;s only a matter of time until they screw it up. I&apos;d rather keep the build-up going a while longer and hold out on the part where it inevitably goes to hell, at least temporarily. 3) Because everyone needs to live where they live. Let&apos;s say they do stay together. What happens then? They get married and stay in the loft? Probably not. Or they break up. Does someone move out, at least temporarily? Maybe. The ensemble at-home dynamic is part of the joy of the show. Everyone needs to stay put. Schmidt basically lost it when he found out Jess and Nick kissed. If Miss Day becomes Mr. Miller&apos;s girl, it upsets the bromance of S&N, and let&apos;s face it, the "no-nail oath" was all about maintaining equilibrium among the men. But oh, please, dear Liz Meriwether, if they do become a couple, please let Schmidt catch Jess and Nick in the shower. Because holy crap, Max Greenfield would rock that scene. 2) Because how long can you realistically hold out on them? Hard truth, if Jess and Nick get together, they won&apos;t stay together throughout the remainder of the series. I&apos;m going to go out on a limb here and predict they&apos;ll be endgame, but there&apos;s likely to be a little bit of a Penny/Leonard style dynamic, with fewer Star Trek references, at least for a while. But still, you gotta let the story tell itself. Keeping them apart for too long will just start to feel forced after a while. 3) Because they are just so freakin&apos; cute and sweet and funny. And they&apos;re really good for each other. That&apos;s all. No elaboration required.